Finishing trowels are used in finishing the surface of the plaster to the required smoothness. Troweling represents the last stage in the finishing process of the plaster. 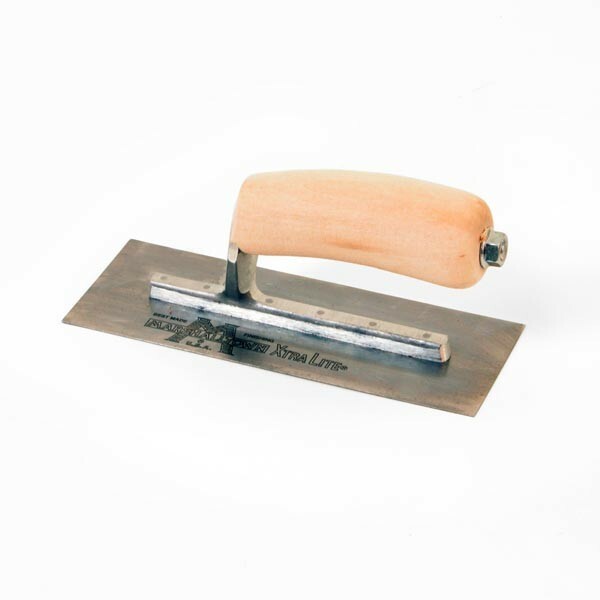 This action helps compact the surface and adds to the quality and durability of the work. This finishing trowel has a high carbon, steel blade, and the blade is cross-ground (usually only found on better finishing trowels) to hold its shape better. The curved handle commonly called a California or Camel Back pattern is designed for better handling. Each handle is machine fitted onto the milled shank. Tests prove it took 30% more torque to twist a Marshalltown handle than that of the nearest competitor because of its "Diamond Shank" design. Finishing trowels are narrower and longer than plastering trowels and the blade is slightly convex. The standard width is 10 cm (4 inches) but the length may range from 30.5 to 50.8 cm (12 to 20 inches). Many finishers use a fanning pattern for the final finishing, which usually requires a narrower blade that is 7.5 to 9 cm (3 to 3-1/2 inches) wide. Ten rivets are used in the shorter trowels but as many as 16 are used in the longer sizes.